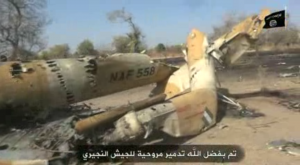 The video did not, however, show the actual time the group claimed to have hit the aircraft, but showed the debris of the aircraft and that of several other destroyed military tanks, trucks and a drone, following what Boko Haram claimed, was the aftermath of a week long battle with the Army. 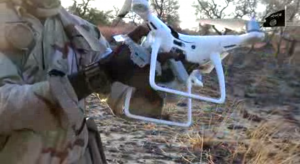 Seven minutes into the video, the group apparently used a telescope and a drone to spy on military positions, which showed for the first time, Boko Haram deploying drones to prey on security forces. The group fighters, as seen in the video, mostly underage boys, were brandishing different types of sophisticated weapons haphazardly as they defend their turf from the unrelenting push by the Army. The Abubakar Shekau led faction of the insurgents have used military grade weapons to attack security forces and other unconventional methods, including suicide bombings to attack innocent civilians, particularly in the states of Borno and Adamawa in Nigeria and parts of Cameroon. An approximated 50,000 people are reported to have been killed in about a decade, while over 2 million people have been forced out as a result of this bloody conflict in the Lake Chad region. ← WHY REPORTING TERRORISM IS AN UNSAVOURY BEAT IN NIGERIA. Weeping so bad for my nation. How it sound so strange that insurgents are using military grade equipment to spy and fight the government military.